Take 15% off sitewide at The Knot Wedding Shop! Use code 15GIFT at checkout. Hurry, expires November 15. Your guests will glow with delight when you present these classic votive favors! Adorable in welcome baskets and equally chic on reception tables, candle wedding favors are always in style. 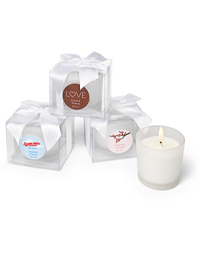 Each glass votive cup contains a white poured candle and arrives in a clear acetate gift box with a white satin bow. Choose from fabulous label designs to complement your theme; simple assembly required (applying stickers to the front of gift boxes). Unscented candles; each measures 2" x 2" in a 2 1/2" x 2 1/2" gift box. Falling leaves form the perfect backdrop for autumn nuptials! 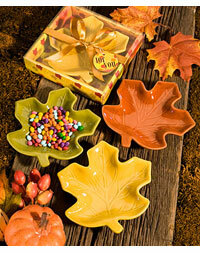 Give guests chic keepsakes with these colorful ceramic candy dishes. In shades and shapes of the season, they&apos;re great for adding decorative flair to your reception tables (and their homes). The detailed leaf dishes are sold in an assortment of fall colors; each comes in a leaf-themed display box with gold satin ribbon and a matching "For You" tag. 5 1/4" x 5 1/4" x 3/4". Assortment varies (sorry no choice available).